Although the lake levels are not high, the second half of this access track is very boggy - gumboots required. Primarily for fishermen, this track provides access to Lake Wairarapa. It is about 800 metres from the gravel road, and can be waterlogged and boggy in winter (it is about the same level as the lake!). There are also two wide and very muddy patches crossing the first paddock near the road; if it has been damp the mud can be knee deep. Head out of Featherston on SH53 towards Martinborough, and after about 10 km turn right on to Kahutara Road. Turn right on to Parera Road about 14 km down Kahutara Rd. 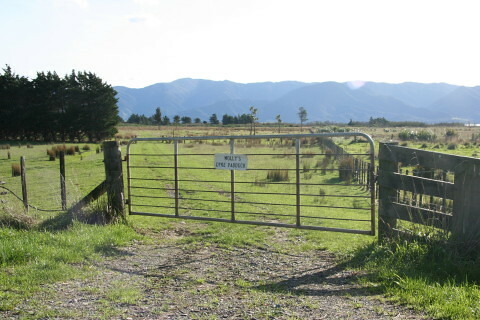 Parera Road is a gravel road and is just after Oporua Floodway. You will go past Boggy Pond. Look for a sign on a gate saying Molly's Dyke Paddock on your right about 6 km from the Kahutara Rd turnoff. Park your car on the verge of the road near the gate.